Screenshot from ‘The Day After’. Already this year, we’ve seen Donald Trump tweeting provocative nuclear threats about North Korea. A terrifying (but false) incoming missile alert set Hawaiians on edge, while the Centers for Disease Control and Prevention planned (and then postponed) a nuclear attack preparedness session. The Pentagon has also proposed a policy of possible nuclear retaliation for cyberattacks. As a teenager, I remember being horrified about the possibility of nuclear war. I watched daily news reports about the nuclear arms race between the U.S. and the Soviet Union and listened to music about “what might save us, me and you,” as Sting’s 1985 song “Russians” put it (the answer: “If the Russians love their children too”). 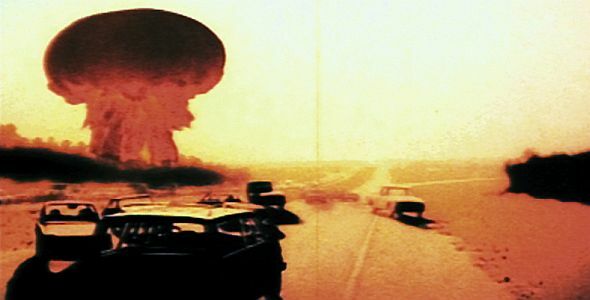 But I especially remember the television event of 1983: “The Day After,” a fictional, made-for-TV movie that imagined a nuclear attack on American soil. The debates and discussions the film spurred make me wonder if a similar sort of high-profile cultural event would serve the country well today. At my junior high school in Southern California, “The Day After” was what everyone was talking about leading up to (and following) the night it aired on ABC on Nov. 20, 1983. By all measures, it was a major media event. An estimated 100 million viewers tuned in. The White House phone lines were jammed and ABC headquarters in New York received more than 1,000 calls about the movie during its East Coast broadcast. “The Day After” imagines a scenario in which America’s policy of deterrence fails. It depicts a nuclear attack through the experiences of Midwesterners – doctors, students, children, the pregnant and the engaged – followed by an extended (and, though grim, fairly unrealistic) consideration of post-blast repercussions. Leading up to the attack, there is quotidian normality, followed by localized shock at the terrifying sight of missiles being launched out of the ground from Kansas missile silos. Panicked anticipation of an incoming nuclear attack follows, replete with period novelties such as huge lines at pay phones. Although dated and artless in many ways, the representation of the blast remains horrific, if only by virtue of what it forces us to consider: the fire, wind and chaos; the widespread damage and suffering; the desperate need for medical care; and the futile desire for order and assistance. Society as the characters in the movie knew it – just a day before – was a thing of the past. “The Day After” was controversial even before it aired, with critics like Tom Shales of The Washington Post deeming it “the most politicized entertainment program ever seen on television.” Reverend Jerry Falwell organized a boycott against the show’s advertisers, and Paul Newman and Meryl Streep both tried (unsuccessfully) to run anti-nuclear proliferation advocacy ads during the program. In the text that scrolls at the end of the film, “The Day After” declares its intention to “inspire the nations of this earth, their people and leaders, to find the means to avert the fateful day” – to, in essence, scare some sense into anyone tuning in. Pro- and anti-nuclear groups used the film as a rallying cry for their positions. An Oct. 4, 1983 LA Times article (“‘The Day After’ Creating a Stir”) detailed a “conservative counteroffensive” that attempted to “discredit the film and write it off as a media conspiracy against Ronald Reagan’s strong defense posture.” Reagan supporters also hoped to defuse potential public backlash against American nuclear missile proliferation in Europe. Outside of partisan lobbying, “The Day After” opened the door for public debate about nuclear weapons. After the movie aired, Ted Koppel moderated a discussion that featured an all-star cast of public intellectuals and politicians. The most prescient and horrifying questions from the audience and responses from the panelists on “Viewpoint” anticipate a future that’s eerily indicative of where we are today – a time of multi-state nuclear capability, where one unstable leader might trigger nuclear catastrophe. In the weeks after the broadcast, schools and community centers around the country held forums during which people could discuss and debate the issues the film raised. Psychologists and communication scholars were also eager to study the movie’s impact on viewers, from how it influenced their attitudes about nuclear weapons, to its emotional consequences, to whether they felt empowered to try to influence America’s nuclear policies. In the early 1980s, of course, it was the Soviet Union that posed the nuclear threat to America. Today’s adversaries are more diffuse. The world’s nuclear situation is also much more volatile, with greater destructive potential than “The Day After” imagined. A modern-day remake of “The Day After” would have to reckon with this bleaker scenario: a world in which there may be no day after. The bellicose posturing that prevails in the White House today resonates, in some ways, with the public bickering between Soviet Head of State Yuri Andropov and Ronald Reagan in the months leading up to the broadcast of “The Day After.” After the film’s release, New York Times columnist James Reston hoped “the two nuclear giants” would “shut up for a few weeks” – that “some civility or decent manners” might prevail in the wake of public concern about the consequences imagined in ABC’s somber nuclear fable. But as then-Secretary of State George Shultz pointed out in the Koppel interview, the aim of the Reagan administration was to never have to use nuclear weapons. It was to deter our nuclear adversary and to reduce our nuclear storehouse. Shultz’s words of assurance are a contrast to today’s rhetoric of nuclear one-upmanship that is totally removed from the devastating reality of nuclear war. Trivializations of nuclear warfare on the order of “my button’s bigger than yours” undermine the grave reality of nuclear cataclysm. Such rhetoric is no longer the domain of farce, as in Stanley Kubrick’s “Dr. Strangelove,” in which erratic, incompetent leaders bumble their way into the apocalypse. Perhaps some modernized version of “The Day After” could function as a wake-up call for those who have no real context for nuclear fear. If nothing else, “The Day After” got people talking seriously about the environmental, political and societal consequences of nuclear war. It might also remind our current leaders – Trump, foremost among them – of what modern nuclear war might look like on American soil, perhaps inspiring a more measured stance than has prevailed thus far in 2018. This entry was posted in Cyberwarfare, Government, International Agreements, Military, Technology, War, World War III and tagged Atrocities, Centers for Disease Control and Prevention, cyberwarfare, Donald Trump, George Shulz, Hawaii, International Agreements, Military, North Korea, nuclear arms, nuclear war, nuclear weapons, Ronald Reagan, Soviet Union, technology, Ted Koppel, The Day After, War, World War III on January 25, 2018 by MNgranny.